As the shelves in the basement fill with organic blackberry jam and organic blueberry jam – both picked by yours truly and my family in Ann Arbor, MI- I began to wonder if I was saving any money doing this myself. So I trawled the grocery shelves for a comparison equivalent to what I make – just organic fruit and pectin. I was hoping to show I am saving my family money by doing it myself. I didn’t. In fact, adjusting for the assumption the two companies are sending their jars of jam in bulk cases – my own homemade, hand-picked efforts do not compete at all with the economies of scale evident on a per ounce price basis for the other jams. The prices came out virtually the same – $0.79/ounce for my homemade jam vs $0.77/ounce for both Food for Thought and Bionaturae equivalents. Bionaturae’s spreads travel over 4500 miles to get to Ann Arbor, my berries came from around town – 64 total roundtrip miles. However, assuming that Bionaturae sends 150 cases at a time, with 12 jars in a case – that works out to $0.29/mile/ounce as compared to my mileage of $0.25/mile/ounce (I assumed 16 jars for my traveling). Assuming that Food for Thought sends 50 cases at a time – that works out to only $0.02/mile/ounce. However, once again, given the economies of scale involved in transporting bulk jam, the carbon footprint of eating jam from Italy is negligible. It is only once we assume that Bionaturae and Food for Thought are sending one case at a time do the numbers move in favor of making jam at home. In that scenario, the Italian jam becomes $44.50/ounce or $400.50 jar and the Homer MI jam becomes $1.94/ounce or $18.43/jar – compared to my homemade effort at $6.40/jar for freshly picked organic jam. Which leaves the priceless intangible benefits – the joy of picking berries as a date on the weekend, feeling the quiet between the rows as the bees buzz in the summer heat, smelling the cooked fruit on the second floor hours after the canning process is complete, the satisfaction of handcrafting food for one’s family and friends, the pleasure of talking to the family who grew the fruit, and the expectation of opening a jar in the middle of January and remembering what it felt like to be warm in a tank top and see one’s brown toes in the dry grass. 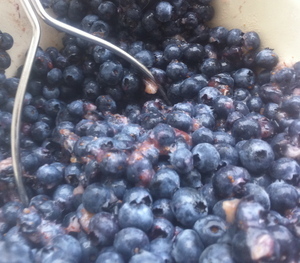 This entry was posted in On the Farm and tagged Berry Jam, Corinna Borden, organic farming, Real Time Farms. Bookmark the permalink. Thanks for the spreadsheet link update Corinna. You know, you do have more flexibility in calculating costs than you’re giving yourself. You call them “intangibles”, but there is a very tangible need to get out of Dodge and relax, and berry picking on a nice day is tantamount to a vacation. In fact, we do our blueberry picking at a farm near a lake with a swimming beach and make it an afternoon mini-vacation, which we want/need to do anyway. So anytime you can combine a large chunk of the mileage with another task/event, you can take away the cost of most of that $0.25 per ounce you added for miles driven. The other big intangible is paying yourself. Yes in the sake of full disclosure you could include that, but in all likelihood you wouldn’t actually have replaced those three hours with three hours of alternate paid work, you would have done something else lovingly for the home (baked bread, weeded, whatever). The IRS doesn’t let you include an hourly wage for yourself in calculating costs of homemade goods (say, in a cottage economic sense) if you’re not actually a paid employee of yourself… so why should you add it in here? Given those two changes, you can subtract $0.44 an ounce for your jams, and that puts you down to $0.35 an ounce, less than half the cost of the boughten kinds. Need more? Reuse jars every year and amortize the costs of those jars over many seasons (reduce your cost by another 10-20%). Extend these same economies to growing/preserving most of your food over the course of the year, and you can save hundreds of dollars a month over what you would have to pay for truly equivalent goods at the store… and in many cases there are no truly equivalent products. 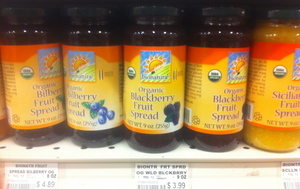 Can you find organic blueberry jam that contains only blueberries and pectin in the store? Thanks a lot for the post… got me thinking about our own economies at Dragonwood. Paul you are amazing! This is SO true – and I feel that you hit the nail squarely on the head with your hard work…reusing the jars and amortizing the costs over years make it much more cost effective (an option companies don’t have). Also combining the berry picking with another trip is a great point as well. I did not realize that for cottage industry purposes you are not allowed to pay yourself according to the IRS, that is fascinating. Thank you so much for this thorough reply! You rock!